The ancient town of Oplontis has been discovered under the modern town of Torre Annunziata, around 22 kms from Naples, and it was destroyed by the same eruption of Mount Vesuvius that destroyed Herculaneum and Pompeii in 79 A.D. Excavations brought to light an amazing villa (called Villa Oplontis or Villa Poppea) that displays some of the most beautiful Roman frescoes ever found and that probably belonged to Poppea, Emperor Nero’s wife. Oplontis is close to Herculaneum, the ancient Roman beach resort but was kept in a good state of preservation, allowing us to see original pieces of wooden furniture, charcoaled food and two-storey houses. 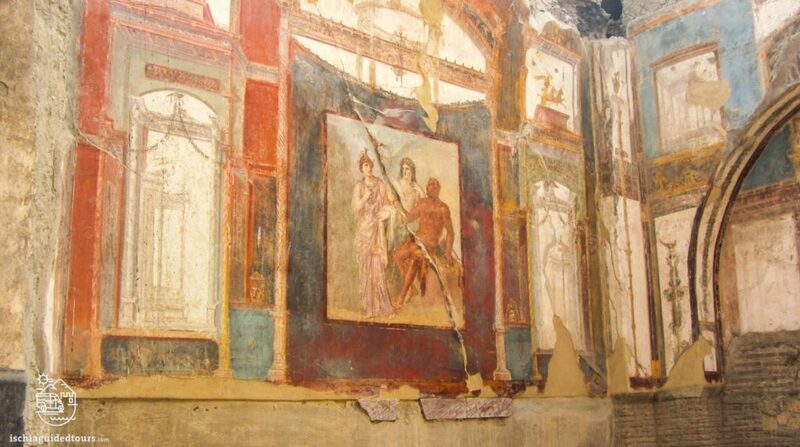 This tour includes a visit of one hour at Villa Poppea and a two hour visit at Herculaneum. The sites can be reached by train or private taxi and the length of the full day tour is approx 5 hours.